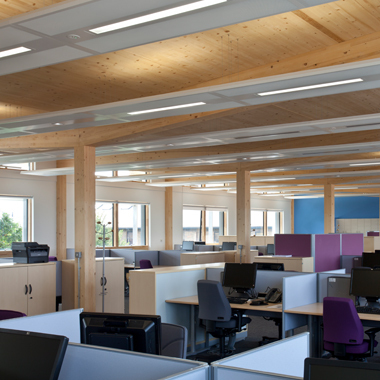 During the last decade timber has been widely adopted for use in multi-storey buildings in residential and education sectors, however, it is used far less frequently for multi-storey office buildings in the UK. Office spaces must provide environments that are comfortable, healthy, safe, and durable. An office building must be designed in a way that its internal layout remains flexible during the lifetime of the building in order to accommodate the specific needs of a variety of different tenants in terms of internal layout and fit-out. As a result, multi-storey office buildings have a structurally open plan allowing for a variety of internal layouts to suit the needs of the occupants. 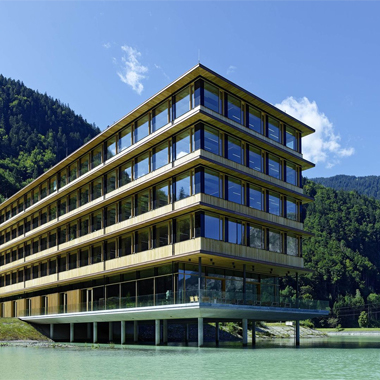 Engineered timber products can compete with other forms of construction, e.g. concrete or steel, in the field of multi-storey buildings. Requirements for office spaces have changed significantly in recent times. The change in occupancy and the demand for flexible spaces requires structural solutions to accommodate various types of use. The growing digitalization in businesses impacts the planning of office spaces and stipulates new building materials and construction techniques. 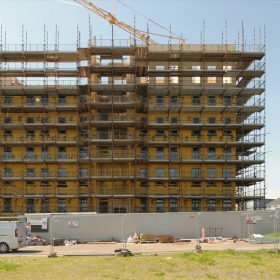 Timber construction is gaining more and more popularity as it offers some major advantages, such as high accuracy due to prefabrication, quicker erection times, lower embodied energy and carbon footprint, as well as efficient use of material due to controlled engineering and fabrication to name a few. Alconbury Amenity Building is a two-storey community centre. It is one of the first projects built on a large development site near Huntingdon. Over the coming year, the former airfield will be redeveloped to make a new town. The building structure is a hybrid of CLT and Glulam. It contains open-plan offices, together with a gym and conference hall. The building is clad in a curtain walling system. Solar shading for the upper level is provided by the overhanging roof structure, and for the lower level by a cantilevering canopy supported by the solid timber structure. The Christie’s Care Office building is located on the outskirts of Saxmundham in Suffolk. The two-storey pitched building is oriented north to south, and houses approximately 60 employees. 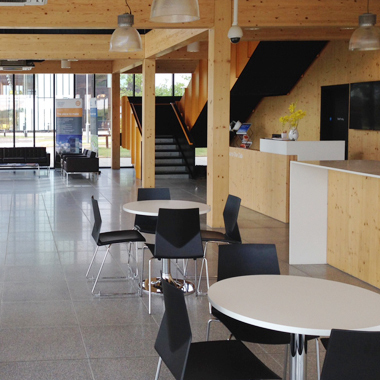 Large cylindrical solid timber columns provide structural support to the steeply pitched roof of the building. 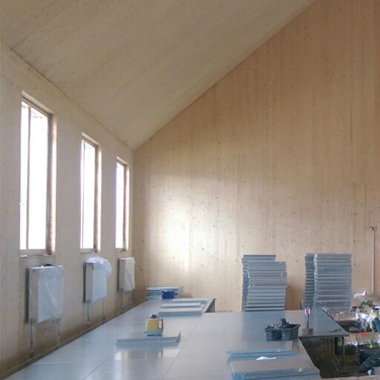 The CLT structure is largely exposed on the interior and has been treated with a white wash to prevent the longer term darkening of the timber caused by UV light. A circular window in the southern gable enables sunlight to track across the interior. The window opens in a way that provides cross ventilation, allowing hot air to escape in summer. A community health building for South Gloucestershire Council. The Kingswood Locality Hub is a three-storey, multi-use building that provides services for the council and local NHS trusts for children and young people in the area and their families. 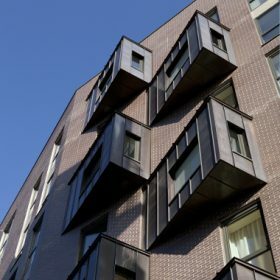 The design supports the council’s accommodation strategy which promotes more efficient use of buildings, this includes the provision of large open-plan spaces. The building also responds to the council’s carbon reduction commitment. Rooftop extension including a new CLT floor, with visual Glulam columns & visual roof with splayed roof edge. 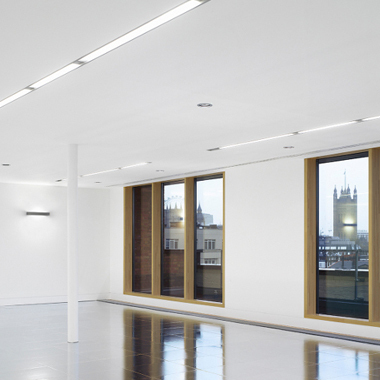 Refurbishment and roof extension providing office accommodation in a former 1920s depository building in London SW1. The lightweight timber structure was used to make a fifth storey on the roof, increasing the existing three storeys of office space to four storeys. A new double-height entrance was created at ground floor with improved main circulation throughout the building.